Love the camouflage! Definitely a great pattern for a baby boy! 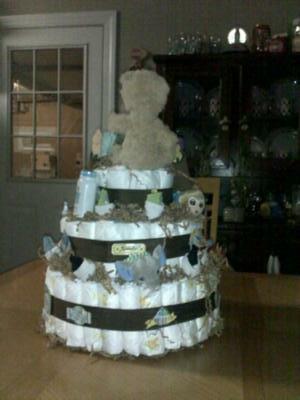 Tiffany made this cute diaper cake with her sister-in-law and then wanted to share it with us! We are pleased to post it here for everyone to enjoy! Our readers are fantastic because they 'pay it forward' with delightful ideas, photos and inspiration! Thanks Tiffany! 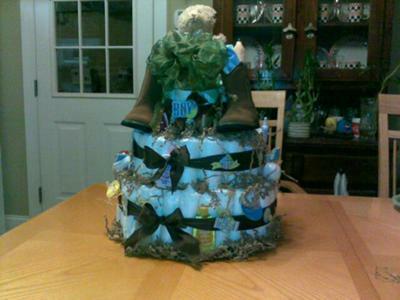 If you have a diaper cake to share, send it on over! We'd love to share it with the rest of our readers! My sister in law and I made this for her son and fiance who were fixing to have their first baby. They wanted camouflage on it and we went from there. It is more or less an eclectic theme. We had camouflage on some of the ribbon and we took camouflage tape and taped it over a cake plate. We used both newborn and size 1 diapers for this cake and it was a huge cake, a total of 184 diapers. We then used brown and green ribbon and had bottles filled with candy for the center of the cake. We went to several stores and got pacifiers, baby wash, baby powder, baby wipes, baby lotion, socks that we made into little flowers, a stuffed bear and pair of little boots as the topper, we also got little washclothes in the shape of footballs, basketballs, and baseballs and placed them around on the cake. Needless to say there was a little of everything on this cake. We had a blast making it! You are a great diaper cake crafter! I really love your style...Thank you! Definitely a boy cake! This is out of box idea! I wanna make the same kind using some more boy things like the cap and all. Later I will put the pics in the blog of mine like you did. Hope you will referring to it. I found your blog via Google while searching for creative boy diaper cakes and your post looks awesome. Thanks for sharing and keep on sharing. The Camouflage is nice! The pair of little boots is unique. A perfect boy cake!